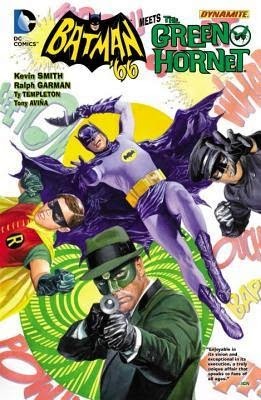 This is the first Batman '66 I've read but I'm a long time fan of the show and am also a fan of Dynamite's Green Hornet series so it is no surprise I had to read this book. Basically it is a Batman story with Green Hornet and Kato as the guest stars and Batman '66 follows the classic TV series to a tee. It's just as campy, corny and silly as one could expect and the characters are drawn to a likeness of the actors who played them. Joker (as played by Ceasar Romero) is the villain in this episode along with Colonel Gumm from the actual TV episode where these two duos first met. I had a lot of fun reading the graphic but honestly the constant alliteration became annoying very fast. I'll enjoy watching re-runs of Batman but won't be going in for anymore Batman '66 issues.